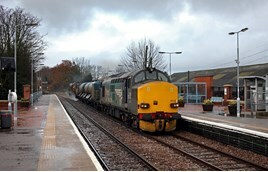 Direct Rail Services has developed a business plan for the next 20 years, but admits that the use of heritage vehicles (‘20s’, ‘37s’, ‘57s’) is “no longer economically, technically or environmentally viable for the entirety of the current strategy period”. The company also confirmed that budget constraints could delay locomotive overhauls, and that the selection of traction for return to traffic, modification and sidelining has to take account of the relative condition of a particular unit. The value at which a locomotive stands in DRS’ accounts also plays a part. This means that 37409 Lord Hinton will be returned to traffic. However, it has also identified that the Class 66s (66301-66305, 66421-66434), although reliable, are not capable of fulfilling its business requirements for the next 20 years. No details have been given as to their disposal. For an EXCLUSIVE insight into DRS, read RAIL 842, published on December 20, or available on Android/iPad on December 16. The 20's have been doomed for a while, not powerful enough. The refurbished 37's are good for years, as long as the dmu replacement services run. Much cheaper than the 68's. 66's, since the 68's came the work has shrunk dramatically, hauling ballast/renewal trains is all I've seen them on recently. GBRF needs look no further. 57'0's no work for them since the 66's came. 57'3's, pullman and special passenger work, can't be worth keeping them just for that. The 68's could cover if there's enough of them.